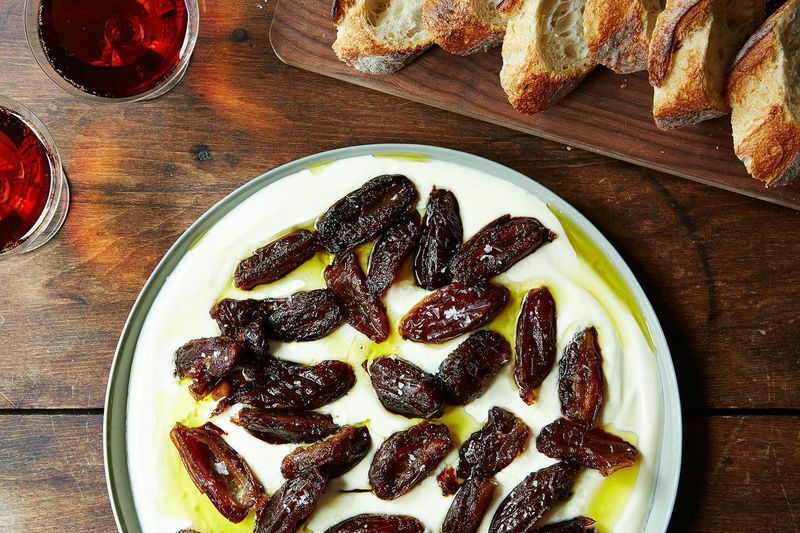 Today: Why the laziest appetizers are always best, especially the 3-ingredient snack you should serve at your Oscar party. Appetizers don't have to be much to be perfect. The best ones require nothing more than plating: a platter of olives, or cured meats and cheeses, or whole radishes with butter and salt. These are what people really want to eat before dinner. An ideal pre-meal meal should be inherently pretty (without having to form any sort of ball or log), and dramatic enough in flavor and texture to prod your appetite. It should be bite-sized, communal, and inviting of conversation ("Are these from the salami of the month club?" "Did I ever tell you about the first time I dipped radishes in butter?" and so on.) Olives will do. Appetizers like these are a free pass, and we might as well take it. Because when we don't have to mix and mold and garnish or keep anything crisp, we can focus on the rest of the evening -- whether that's a multi-stage dinner party, or just sitting around the TV clinking coupes and missing Joan Rivers. 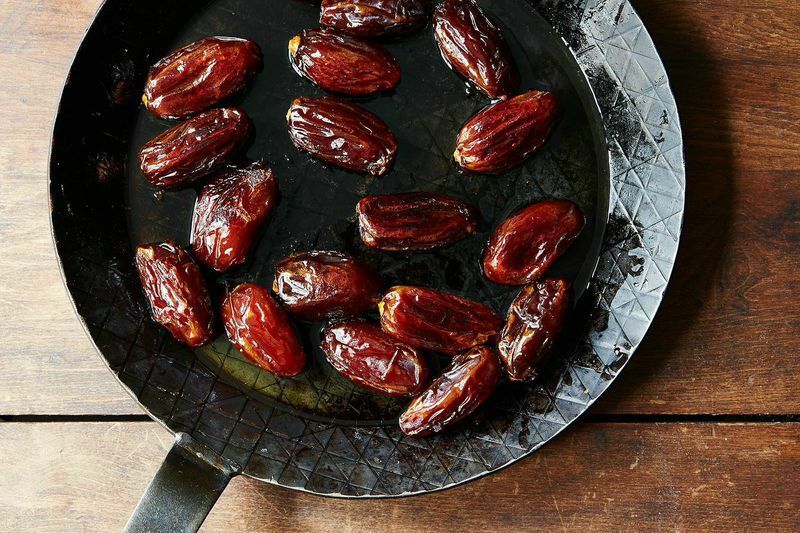 Renee Erickson's sautéed dates are one of these effortless treats, but also have the benefit of being entirely unexpected (go conversation go!). 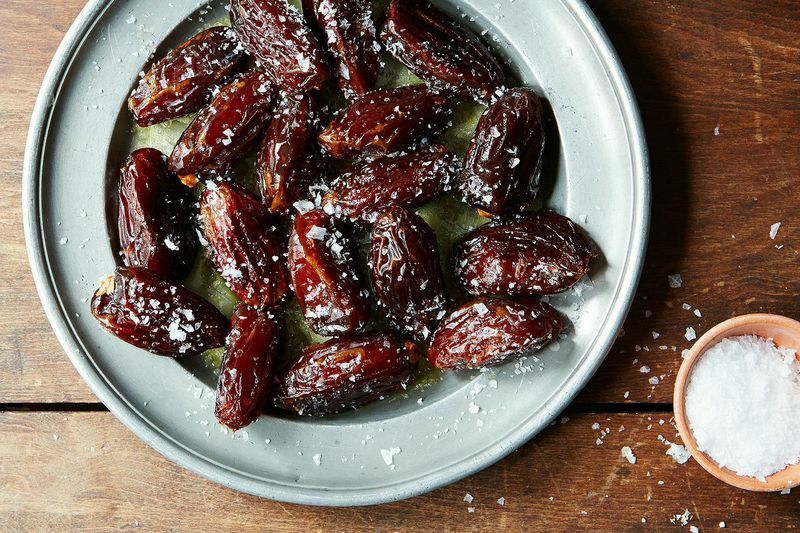 Dates don't need to be stuffed with anything or wrapped in bacon to be a convincing appetizer -- they just need a little framing. 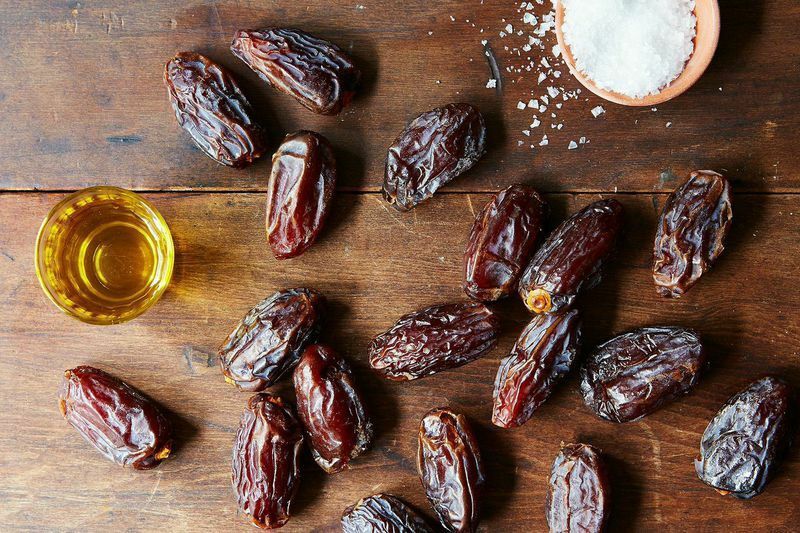 On their own, dates can be almost too sweet, which is why many of us rarely think of them at all, or blend them up into breads or shakes as a natural sweetener. But once harnessed with a little salt, the sugar stops being overwhelming and the winey, butterscotch-y nuances become clear. We're familiar here with salting in the form of bacon or goat cheese, but it could also just be salt. At Erickson's flagship restaurant Boat Street Cafe, she serves them just like this: unstuffed, unwrapped. After heating quickly in a pan with olive oil, the hot, fat dates are plated with the puddle of oil they were cooked in, plus lots of jagged salt crystals. You eat the dates with your hands -- the salted skins have tightened and turned to caramel in patches; the centers have gone molten. Then you find bread to mop up the warm oil lingering at the bottom of the bowl. Though they're a sound match for a bubbly drink, Molly Wizenberg likes to eat them over yogurt for breakfast. You could also pit and chop them first and add them to salad or even scrambled or fried eggs, a comforting Middle Eastern breakfast. But my favorite riff is how my friend Nozlee Samadzadeh served them at a dinner party celebrating the recipes celebrated by Wizenberg on Orangette. Nozlee pitted the dates before sautéing them, then spilled them and their oil over a pool of Greek yogurt that had been thinned with more olive oil. It was a thing of beauty, cool yogurt against warm dates and everywhere good oil and salt, that we were able to sweep up all together with slices of baguette. And sweep them all up we did. The Genius Recipes cookbook is here! (Well, almost.) The book is a mix of greatest hits from the column and unpublished new favorites -- all told, over 100 recipes that will change the way you think about cooking. It'll be on shelves in April, but you can pre-order yours now. This is so delicious. I love dates but often their cloying sweetness can be an overkill. I made these for a mini lunch at home, Maldon sea salt never disappoints! Mmmm. 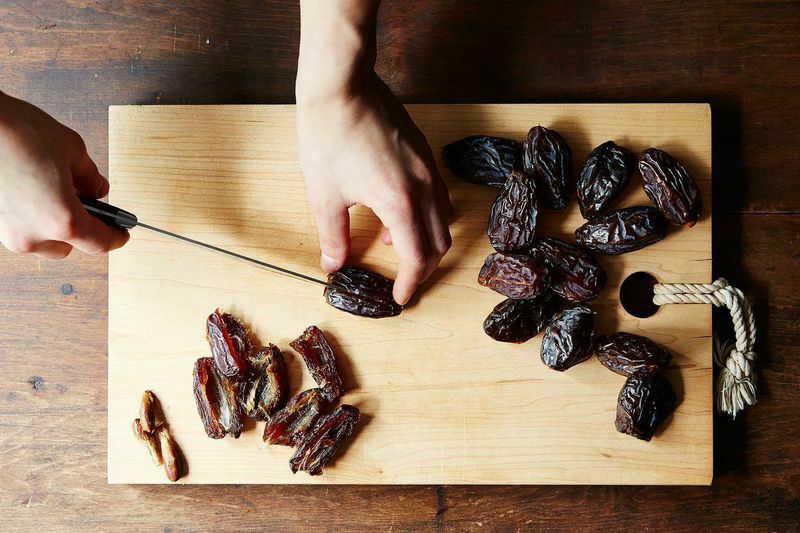 Happy to find any new savory uses for dates. This is easy and delicious. 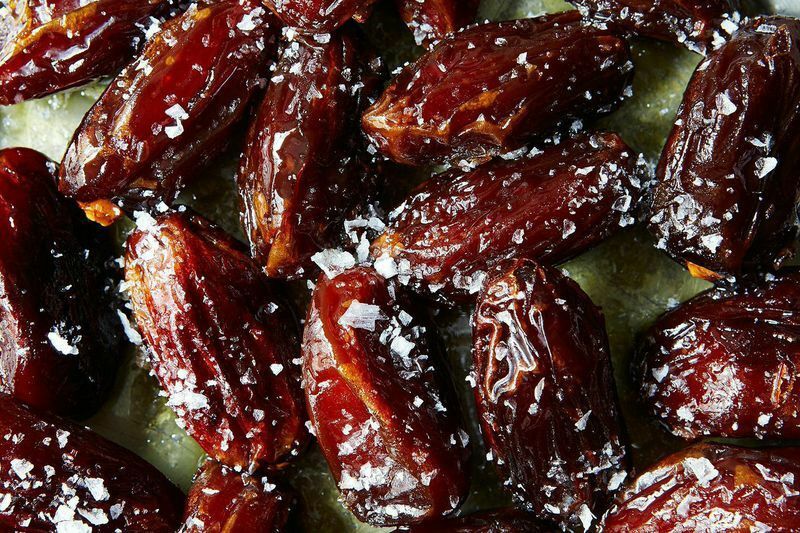 Nice to see dates freed from their "date-nut-bread" prison. I especially like SueD's idea of using smoked salts. Hickory smoked salt is my choice and what I always have on hand. The possibilities are endless. Thanks for sharing. The narrative mentions serving this over Greek yogurt thinned with olive oil. Can you suggest rough proportions for this, and any cautions about how much to mix it? Hey, I mixed together the greek yogurt, olive oil, and salt totally impromptu, tasting as I went, but I probably added a scant 1/4 cup of oil to about a cup of yogurt. The important thing is to whisk them together well to loosen up the thick yogurt until it's smooth and until the ribbons of oil are well incorporated. Lately I’ve been making a delicious recipe “Sautéed Parsnips with Dates and Spiced Yogurt” which I adopted from Food& Wine. Jeff Cerciello says the inspiration to combine parsnips and dates came from Moro, a Moorish restaurant in London. To get the parsnips nicely browned, he cooks them on the stovetop in batches before roasting them with the dates, which caramelize in the oven. The dish is served with a simple but delicious plain Greek yogurt sauce mixed with fresh lemon juice and sumac. I like to also sauté carrots with the parsnips and add 1 tablespoon of Za’atar to the yogurt sauce. I have been making these as the laziest appetizer when friends stop by since I can remember because they look fancy, taste amazing, and take all of 10 minutes to prepare. The best! Ohh, ohh. I think they might be good with smoked salt. So very fond of a variety of smoked salts, applewood smoked or Chihuahua smoked? hmm. I had these at The Walrus and The Carpenter in Seattle and fell madly in love. On the menu they were called Roasted Dates so my attempts at recreating them fell short. I am so glad I can now make these at home! So simple yet so amazing! Yesssss. Have been dying to make these since reading Delancey. They look/sound so good! Love that photo with the big salt flakes too. This has been my favorite way with dates (sautéed and sprinkled with salt and served over whole Greek yogurt)ever since I read Molly's take on the dish. So glad you've featured it here!